It's nice to get a book which ticks off many things on a wish-list. First of all the book explains a Rock genre which I didn't fully understand. Next, it details the importance of The Allman brothers which I did not previously fully appreciate and lastly has sizeable biographies of my favourite Southern bands – Blackfoot and Molly Hatchet. 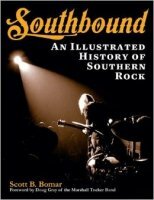 The complete history of Southern Rock is told in this meticulously detailed book by Bomar, from the early days of the Blues up to the present day. We learn that the predominately black Rock 'n' Roll stars mixed and played with the white musicians fascinated with the genre until Martin Luther King was murdered. From that point, it would appear the music worlds polarized and the white players continued playing but in their own furrow which led to Southern Rock. The band that started the genre was TAB and many chapters are dedicated to the brothers Gregg and Duane. Exceptionally successful in the U.S., they created the template for other bands to follow. The other really big name is, of course, Lynyrd Skynyrd and it is not a surprise many chapters are also dedicated to this band in its many guises up to the plane crash and beyond. Unfortunately, a lot of tragedy is involved in the Southern Rock story; notably alongside the Skynyrd plane crash, there was the motorbike death of Duane Allman. The book ends on a positive note – the beacon of Southern Rock is held by a certain Kid Rock; although Detroit born, he is moving the spirit of the genre forward well into the 21st century. This book, containing mini-biographies of the key bands of the genre plus piecing the whole story together, is certainly a one-stop shop for all things Southern.